The University of Medicine 2 (UM2) in Yangon, Myanmar has paid respect to the work of the late Professor David Cooper by dedicating their new laboratory to him, unveiling a memorial plaque in his honour. Professor Cooper, who passed away in March this year, served as Director of the Kirby Institute for 32 years. The establishment of a collaboration with partners in Myanmar was one his final research achievements before his passing. The Myanmar-Australia Research Collaboration for Health, or MARCH, aims to improve the management of infectious diseases in Myanmar. 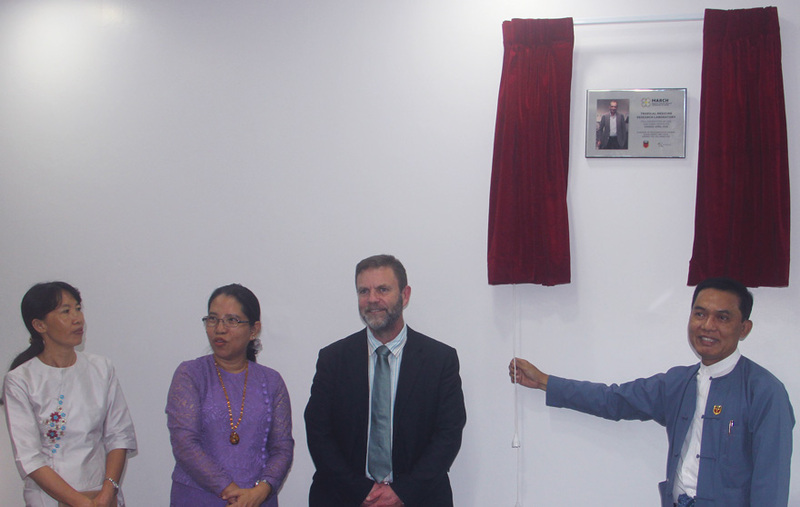 The MARCH Laboratory was officially opened by Professor Aye Tun, UM2’s rector, whose support has been essential to the success of the collaboration. The new laboratory will allow local scientists and clinicians to use sophisticated technology to examine new infectious diseases, including hepatitis C and human papillomavirus. Professor Win Win Maw and Professor Mya Mya Lwin, supervise the research laboratory and its rapid development bodes well for the collaboration, which is already producing work that is informing local and regional management guidelines. Professor Tony Kelleher, who along with Associate Professor Philip Cunningham from St Vincent’s Hospital, has made regular visits to Yangon to oversee the development. “From a shell to a functioning space: overcoming the challenge of importing equipment, to now actually having the lab open and someone employed doing clinical studies is a great achievement,” he said. In recognition of Professor Cooper’s immense contribution, UM2 dedicated the lab to his memory. The engraving on the plaque reads: “In memory of Professor David Cooper, whose energy and vision inspired this collaboration”. Professor David Cooper travelled to Myanmar in June last year to sign a Memorandum of Understanding and to open the MARCH office. L–R: Professor Mya Mya Lwin (Professor of Microbiology, UM2), Professor Mar Mar Kyi (Professor of Medicine, UM2), Professor Tony Kelleher (Kirby Institute, UNSW Sydney), and Professor Aye Tun (Rector, UM2). A team of young clinicians led by UM2 clinicians Professor Mar Mar Kyi and Dr Ne Myo Aung are currently exploring diseases as diverse as bacterial sepsis and tuberculosis. This work is expected to be published internationally in the next 6 months. The development of the new laboratory was partially supported by UNSW Sydney’s Institute of Global Development through one of two seed seed funding grants awarded to MARCH last year. The program aligns with the UNSW 2025 strategic objective of developing significant partnerships to address development challenges and inequality through research, education and practical initiatives.